It’s ant season and many of us in northern Nevada are fighting to keep our homes free from ants. The first step in battling these pests is identifying which species they are. The folks at Grush Inspections have the knowledge to provide you with an expert Wood-Destroying Pest Inspection which includes Carpenter ants. We specialize in recognizing these pests, especially the most common in Reno. There are several species of ants local to northern Nevada. Some are native to the area, while others are invasive species. Given the access we all have to information these days, it is attractive to many of us to troubleshoot and DIY all the issues that create road blocks in our lives. 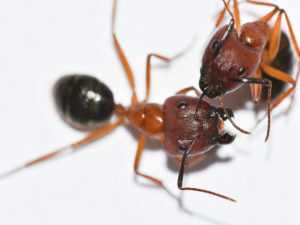 While it is certainly possible to identify which ant species has invaded your home by yourself, misidentification of the given species may delay removal of the pest. Delaying the removal of an ant infestation can potentially cost you money. Carpenter Ants are the biggest threat to structures in Reno and Sparks. This species will burrow into wood structures, including homes and businesses, to begin nesting. The cost of a Carpenter Ant infestation can range from troublesome to catastrophic. Ants in northern Nevada are generally shallow burrowers with most nests above the six foot mark in the ground. Ant colonies often have main colonies and sub-colonies. Most ant species in northern Nevada are nuisances, but fail to pose safety or financial risks. Exceptions are the Southern Fire Ant which has an unpleasant sting and the Carpenter Ant which can destroy the structural integrity of a home. Ants use their jaws for almost everything except eating. For example, they use their jaws to build, fight, and carry food. Ants range in size from less than one millimeter to nearly two inches. Many ant species will eat plants, animals, and everything in between. One tenth of the colony will generally be dispatched to find food. Once ants find food, they use trail pheromones to identify the path between the colony and the food source. This is one reason why it’s so difficult to combat ants in the home. Ants are unable to swallow whole food, so the adults feed whole food to the larvae. The larvae must digest and then throw up the food in order for the adults to eat it. Grush Inspections is focused mainly on the wood destroying organisms listed above such as carpenter ants. Additional pests harmful to wood structures include: termites, wood boring beetles and wood destroying fungus. Choosing Grush Inspections ensures the highest quality and most expedient service. We will ensure that all of your needs are met and your pest problem is identified the first time. Grush Inspections doesn’t just do pest inspections. We are also your go-to inspection service for residential, commercial, heating and air, fireplace, and sewer line. We also offer wood and pellet stove certifications. Schedule your inspection today!